For years Plus Technologies print and output management software has provided value to the automotive industry. Moreover, the past several years Plus Technologies has sold software to many organizations related to the automotive industry. These organizations include: Mazda, Toyota, Porsche, Johnson Controls/Adient, Magna, Reynolds and Reynolds, Renault, Michelin, and DealerTrack. In production line environments, OM Plus print spooling software adds value by reducing print errors, automating print fail-over, providing instantaneous back up in case of failure, providing print confirmation of print to host ERP systems like SAP, adding scalability and reliability. 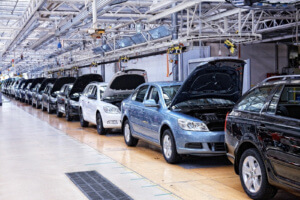 In the case of automotive dealer solutions like the SaaS based DealerTrack system, OM Plus print software provides a secure, cost effective cloud print solution. This solution allows dealers to create documents at the host end (SaaS) then securely deliver the job over the internet to the dealer where the documents are printed locally. Also, without having to use cumbersome and expensive VPN solutions. Recently, Daimler AG has agreed to utilize OM Plus Delivery Manager (DM) for their output management needs. The initial implementation will be provided through a Plus Technologies partner in a North American Daimler AG plant. Daimler AG required a scalable, highly available, reliable, integrated output management solution. The goal of this project is to reduce the cost associated with high downtime due to print related errors and increased production volume. In addition, the print software solution is expected to lower IT support cost as well as eliminate the need for expensive print-related app development. The OM Plus solution at Daimler AG will support their Suse Linux, and JBOSS environments. Delivery Manager seamlessly ingests jobs from multiple systems. DM then delivers them to printers, multi-function devices, fax software, email systems, and more. Rarely, changes are needed to existing ERP/EMR systems. OM Plus print spooler management software features include: print confirmation, re-printing, re-routing, automated fail-over, load balancing, bundling, re-sequencing, and more. Plus Technologies’ print software solutions are based on our core OM Plus Delivery Manager software. Delivery Manager (DM) provides the core infrastructure such as: ERP/WMS/EMR integration, print job routing, confirmation of delivery, and administrative features. Also, based on customer requirements we can add features such as My-Print-Delivery (MPD) for pull-printing, Tamper Resistant Print for Rx printing on plain paper, i-Sat for secure/plug & play internet print delivery for remote locations, Stats Manager for print/copy/fax/scan usage analysis, Fleet Manager for device/consumables management, and more.